What happened at Beyond Next?! Together with the Amsterdam Fashion Institute (AMFI) we welcomed a host of circularity frontrunners to Amsterdam on the 7th and 8th of February during Beyond Next, the first circularity festival. True to our style, we designed the event with an emphasis on practical steps to accelerate the transition to the circular economy. Beyond Next brought together a great mix of industry professionals and the next generation of young talent for two days of speeches, panel discussions and challenge workshops. The festival created a unique blend of inspiration and problem-solving. Half of the 650 tickets were reserved for students, whose contributions made the forum so unique. Our theme of ‘Shifting Mindsets’ attracted wide support. We are especially grateful to our four partners, ABN Amro, HEMA, AMFI and the City of Amsterdam. The programme kicked off with a series of industry workshops at ABN Amro’s circular ‘living lab’ in Amsterdam’s business district, also known as the Circl in the Zuidas district. The pavilion itself is constructed entirely on circular principles. For example, the insulation consists of fibres re-purposed from 16,000 pairs of old denim jeans donated by the bank’s employees. The lift is leased from the manufacturer on a pay-per-use basis. The second part of Beyond Next took place at HEMA headquarters in north Amsterdam. In response to the alarming plastic pollution in our oceans, the Dutch retail chain has set itself a mission to become a part of the solution in tackling the problem. HEMA has banned plastic straws, coffee spoons and stirrers from its stores and aims to reduce plastic packaging in their store by 25 per cent in 2025 and 100 per cent recycled or bioplastic in 2025 for all products. In the same spirit, we wanted to walk the talk at Beyond Next. For our event, we took a number of initiatives to reduce plastic and organic waste from the festival. Catering company Catering Lokaal supported our goals. Not only did they ensure that participants were fuelled by delicious, locally-made and sustainable foods, but they also created an on-site marketplace for leftover ingredients that we could bring home to reduce food waste at the end of the event. Participants were invited to bring their own water bottles to refill, as no bottled water was supplied. More than 40 speakers joined our keynote sessions and panel discussions — a sequence of inspiring, motivational, and at times jaw-dropping speeches on themes related to the circular economy and sustainability. 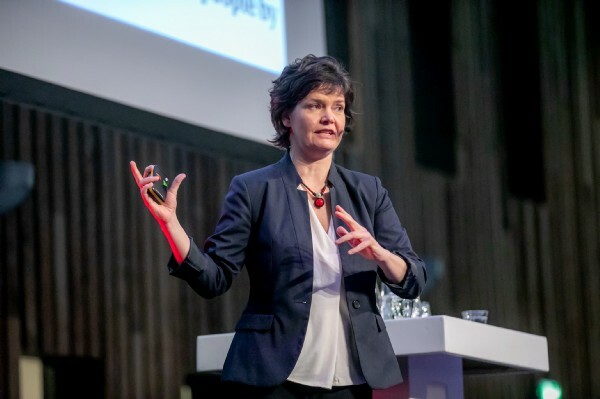 Kate Raworth, bestselling author of Doughnut Economics, highlighted the importance of shifting from the 20th-century extractive mindset — focused on extracting financial value — to a 21st-century generative mindset focused on qualitative benefits for people and planet. Frans van Houten, CEO of Phillips, explained that circular principles have transformed customer relationships in the medical equipment sector. By retaining ownership of its devices, Philips is now in the business of selling benefits instead of machines. With our partners ABN AMRO, AMFI, HEMA and the City of Amsterdam, the festival jointly hosted four challenges on themes of urgent importance to each partner. These were: product-as-a-service, fashion education, single-use plastics, and organic waste in a circular city. In preparation for the event, from December 19 to January 21, we crowdsourced more than 400 ideas and insights from a global community of students, citizens, entrepreneurs, and countless other industry professionals. The Circle Economy team identified and clustered all submissions into key themes that served to support the development of new solutions at the Beyond Next challenge workshops. Once again, we would like to give our heartfelt thanks to all participants for making the circularity festival a huge success. We hope that the ideas generated from Beyond Next will be taken beyond Beyond Next! Watch this space for more on the winning ideas of the workshop challenges, key learnings from the Exploration Track and of course more pictures from the event! Please, stay in the loop!